The goal is to end the AIDS epidemic by 2030. I am hoping to help end the epidemic by participating in AIDS LifeCycle (ALC). 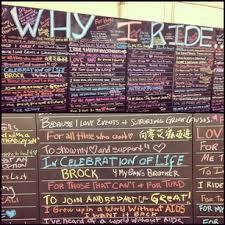 This will be my third time riding ALC and I have committed to raising $10,000 for the San Francisco AIDS Foundation. From May 31 – June 6, 2015, I will cycle from SF to LA to raise money for AIDS / HIV awareness, research and funding. I am doing the 7 day, 545 mile ride on behalf of friends who are positive. Help me support AIDS/LifeCycle by giving what you can. Your contribution is fully tax-deductible and will make a significant difference in the lives of many affected by HIV and AIDS. What Exactly is AIDS LifeCycle? Now in its 14th year, ALC is a ride that takes thousands of cyclists down the coast of California. Participants come from around the US and world to be part of it. The ALC is an amazing event and that takes people across generations and experiences and brings them together to fight the epidemic. To learn more about AIDS LifeCycle visit the homepage: http://www.aidslifecycle.org/. Donate: Click the Donate Button to the right. Ride: You can go to this website to ride: http://www.aidslifecycle.org/register/. Learn: Take time to learn more about what is going on in the fight against HIV / AIDS here: http://www.aidslifecycle.org/hivstats.html.